Summer is fast upon us, and one cant help but be excited about this season’s trend. After a frigid winter across creation, its no doubt, a relief that the sun is shinning brighter than ever. The tropic euphoria is strong this year. We have seen so many clues everywhere, from Stella McCartney to Prada, and of course The Real Housewives of Miami. “La (Dulce) Vida” is the tune of the summer, with the beat of Gloria’s CONGA. The Fruit trend going on is unmistakably what the world was in great need of. The refreshed images of one of the best representations of life on God’s good earth, FRUIT. The Latin flavor this time around is not the known spicy kind, but rather the sweet and juicy tutti & fruity blast of” Wa-tha-ma-len-ne” . 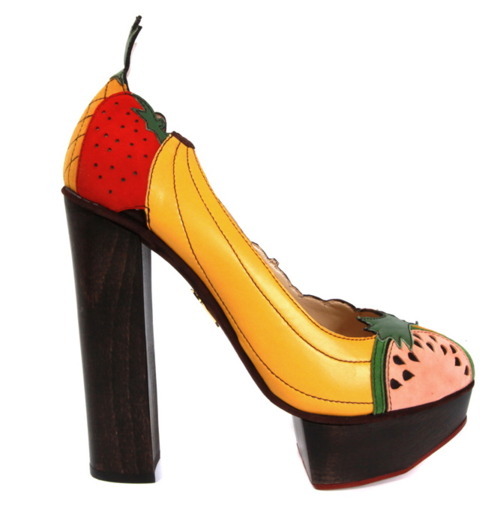 This season’s Charlotte Olympia wooden platforms is in no question the “it” fruit cup of Summer 2011. These hand crafted to perfection, Pina Colada Pumps, are the embodiment of a Diva that lives within every Latina or every woman who craves the lifestyle of Chiquita Loquitas everywhere. That Classic Diva, who remains timeless and a eternal fashion icon. Perhaps the first Caribbean Queen to ever show the level of fabulosity it was to be a bona fide Latina. 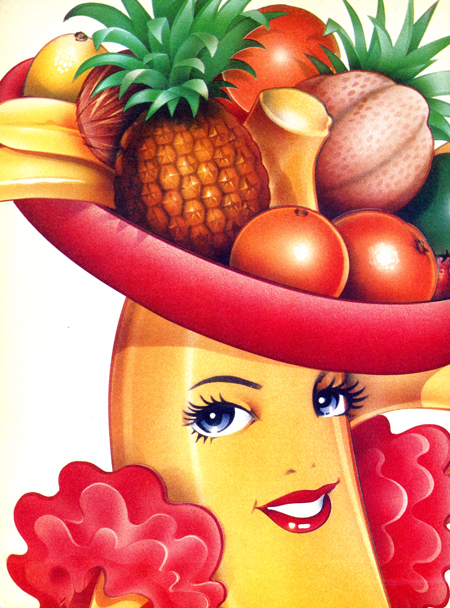 Chiquita Banana, since the 1950s, was one of the first images of Latin America that remains in the hearts of women and the occasional Latino, as a pioneer in music, flamboyance and style, who can’t forget that low cut red ruffled dress. Before there was Celia, Gloria, and Charro, there was Chiquita. After many decades in the business, a gal needs a tune up, the image of Chiquita has evolved many times, but the classic flamboyance of the original Diva is alive and ready to party at the nearest resort. This summer as we prepare for the vacations and destinations to the lands of the wild pineapple and bananas we think back to an icon that stands to be the treasure of any island. The Latin flavor which Chiquita Banana was so known for, brings me to question, What is the image of Latinos in society?, what is it that Americans are always so fascinated with, when it comes to the Latin way of life?. Being a Latino myself I can’t help but to explain the things that many of us have in common as Latinos. No matter if your Cuban, Mexican, or Puerto Rican, the images that have been seen of Latinos seem to have always been in the party life limelight. The limelight that Latinos didn’t waste anytime pointing in their direction, so funny how center stage is named after a fruit, “LIME LIGHT”. The images of family, fun, and living life to every sweet flavored second, is what many Latinos exemplify, if that’s a stereotype, what better one to have, I must say!